Collin Stillman configures the target chamber for a plasma experiment at the University of Rochester’s Laboratory for Laser Energetics. Image courtesy of Collin Stillman. Collin Stillman creates bits of stars on Earth for his University of Rochester doctoral research. 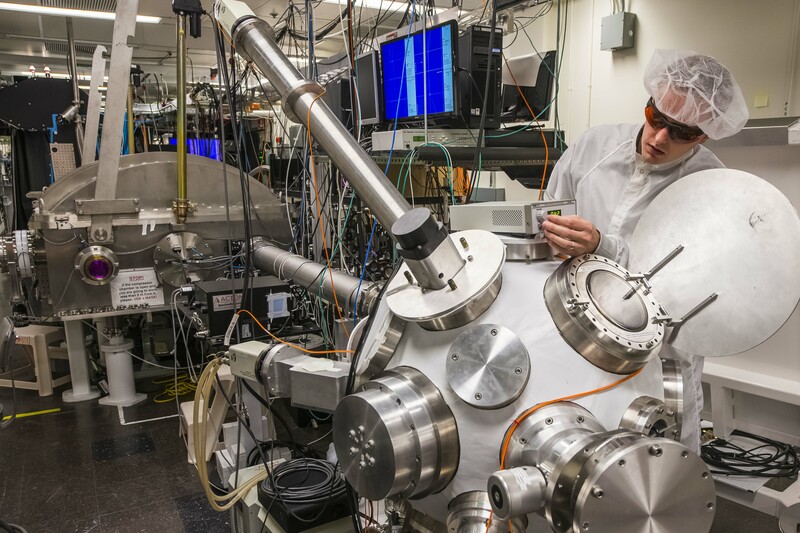 The university houses the Laboratory for Laser Energetics (LLE), home to some of the nation’s highest-intensity lasers. Stillman got acquainted with the facility as an undergraduate at the State University of New York, Geneseo. He’d joined in experiments using a SUNY particle accelerator that developed and calibrated instruments for the LLE. When it was time for graduate school, Rochester was the logical destination, says Stillman, a Department of Energy National Nuclear Security Administration Stewardship Science Graduate Fellowship (DOE NNSA SSGF) recipient. The data Stillman collects also provide input to improve model predictions of these otherworldly phenomena. “As we provide better and better data, we can produce more sophisticated models, which can help us design next-generation experiments, providing better data” in a cycle of advancement. Besides explaining what’s happening in stars, the models and experiments also can help understand earth-bound high energy density situations. Stillman targets opacity, the degree to which high-density, high-temperature plasmas absorb radiation and a major factor in the physics of the sun and other stars. Opacity is difficult to calculate theoretically and experiments have struggled to provide high-quality benchmark data to compare with models. He wants his experiments to produce uniform, homogeneous and well-measured plasmas to generate the best opacity calculations. Besides conducting the experiments, Stillman’s also helped develop the high-tech tools necessary to record these fast radiation bursts and to track how conditions change over trillionths of a second. “The measurements are very complicated and require extremely sophisticated diagnostics,” he says. Interpreting the resulting data also is challenging, especially to determine which signatures correspond to physical processes in the plasma. For their first tests, Stillman and his colleagues chose to embed aluminum in their laser targets because it’s a relatively simple and well-understood element. Now they use foils mixing aluminum and iron, producing new signatures of intense energy flows in the resulting dense plasma. The mixture changes the timing of radiation the plasma emits, providing clues to how energy flows through it. 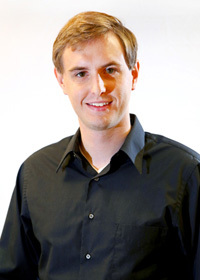 Although Stillman’s thesis research is largely focused on experiment, his 2015 Lawrence Livermore National Laboratory practicum exposed him to the theory side through computational modeling. With researcher Richard London, Stillman worked on coupling two codes that can be used to design X-ray opacity experiments using high-intensity lasers – experiments similar to his own. Combining the codes – HYDRA, a hydrodynamics program that calculates radiation as moving fluids, and ZUMA, a particle-in-cell (PIC) program that portrays individual particles moving through space ¬– should more accurately characterize the experiments. “The radiation hydrodynamics codes by themselves have difficulty treating the interaction of a high-intensity laser with a solid material,” Stillman says. A PIC code is better at capturing the effects of energetic electrons from the laser interaction hitting the target. At Livermore, Stillman performed radiation hydrodynamics simulations of a simplified experimental scenario and linked them with PIC models of electrons from the laser, but the practicum ended before he could fully combine the two. Fortunately, the practicum led to a collaboration connecting the Livermore researchers with Froula’s Rochester group. The laser experimentalists feed data to the modelers and the modelers provide insight to explain the experiments, helping improve them.